Moel Fammau is the highest peak in the Clwydian Range. and once a prominent landmark. The tower was 150' high and 60' in diameter, constructed in Egyptian style. the tower fell down in 1862.
and some restoration work on the remains in 1970. Snowdonia, Cumberland and the Midlands. Conifers now cover much of the slopes, forming part of the Clwydian Forest. Jubilee Tower by Arthur Clarke. Crumpled Crown of the Clwydian Range. the eye inevitably rests on the Clwydian Range which bounds the view. Beyond, lies the land of the Saxon. Conversely from the Cheshire side no trace of the giants of Snowdonia is seen for yet again the Clwydians block the view. They form - the undulating skyline which alerts the traveler that he is approaching Wales. This lengthy chain which stretches from Prestatyn to Llandegla has several fine tops. 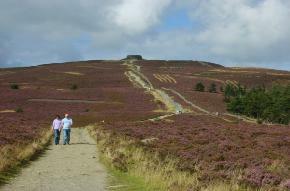 but it is to Moel Fammau (Mothers' Mountain) lying between them that the eye is first drawn. On picnics, by the clearness or withdrawal of her treeless crown". She is, beyond all question, the Queen, and queen like she wears her crown — the most massive man made cairn on any British peak, unchallenged for over 150 years. of a once fantastic structure, roughly pyramidal in shape, some 115 feet high, erected to commemorate the Jubilee of George III. The story of its erection and subsequent collapse is an entertaining one. subscribed for by the inhabitants of Denbighshire and Flintshire, which was to take several years in the building. mountain, a distance of nearly two miles, most of them on horseback." "the sun shone upon the undertaking, and the thousands who attended seemed all animated with sympathetic joy on the occasion". Joy was indeed the order of the day. for in 1862 the tower collapsed in a, storm: and we can be grateful indeed that it is but a pile of rubble. yards of the upper Portion, fell to the ground, probably from the effects of the severe storm of wind and rain which has visited us lately. The Vale of Clwyd Harriers in full cry, followed by a numerous field had just passed"
for at 1.800 feet the view from this highest summit of the Clwydians is most extensive. It looks down on the Dee and Mersey estuaries, across Liverpool land, up the coast of Lancashire to Blackpool's yet more famous tower. The Vale of Clwyd lies serenely beautiful to the west. a solid cairn which distinguishes, but no longer disfigures the peak. for twice within the last few years I have been one of a party which has spent half an hour or so collecting and burying the broken glass littering summit. The Forestry Commission is active in the area, but access is unaffected and it might well be argued that woodlands have introduced a little variety to these heather clad hills. instead it wisely lead's over these fascinating hills a section of the route sufficient in itself to justify the years of work, survey, land, legal, that have gone into its creation. The Denbighshire Free Press (14.3.79) reported a story that following an extraordinarily heavy snowfall in February 1773, Moel Fammau erupted one night at 11 p.m.! The mountain had been heard to utter, as it were, deep groans. The adjacent hills trembled from their roots. The noise at 11 p.m. was like the sound of distant thunder, from the rolling of huge stones down a craggy precipice. in the same instant vast bodies of combustible matter - liquid fire, rolled among the heaps of ruins. Was it true, or a joke? A similar report is in 'A Book of Natural Wonders' by Ellison Hawkes. interior of the chain which was once higher than the Rockies. and the summit is now 1,820' high. Ice age glaciers cut out the cwms and valleys through which the present roads pass. by people of the Middle and Late Bronze Age - Beaker Folk. Although many burial cairns were identified, most are now lost.